You can see that fuel economy drifted up slowly from the forties to the early seventies, barely accelerated at all in response to the first oil shock in 1973, then took off upwards after the second oil shock in 1979, improving several percent per year through the eighties. Then it went into gradual drift again in the early nineties. It seems abundantly clear that the US is going to have to improve its fuel economy at a faster rate in the future to cope with rapid increases in emerging market demand in an oil constrained world. It would have been better if people had done this proactively. However, it appears that it’s going to take a bigger, meaner, oil shock to get people moving in the right direction. 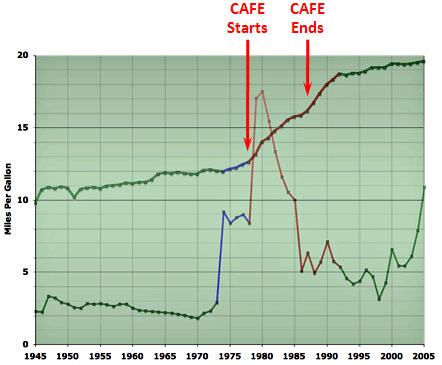 There’s something else that explains this chart much better: the introduction of CAFE mileage standards. They take effect in 1978 and within a couple of years you see the first real spike in average mileage. CAFE standards keep rising until around 1987, and for a few years after that mileage keeps going up while new cars continue to replace old pre-CAFE cars. Then mileage plateaus. In every single year outside the CAFE era, absolutely nothing happens: mileage drifts ever so slightly upward and that’s it. Price signals do matter — which is why a carbon tax or a cap-and-trade system would help reduce fossil fuel usage — but for something like gasoline they need to be large and persistent to really have any effect. That’s why I like to think of them as similar to a tailwind: nice to have, but not always the prime motivating force. If you really want something to happen, sometimes you still need good old command-and-control regulation. Luckily, between 2011 and 2016 CAFE standards are finally set to go up again. High gas prices will help motivate people to buy high mileage cars, but it’s CAFE standards that are going to make the real difference.